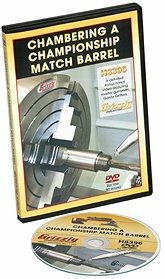 Gunsmith Gordy Gritters and Grizzly Industrial have joined forces to produce an excellent DVD on chambering and fitting match barrels. In our Jan. 5 Bulletin, we ran a segment showing Gordy completing the headspacing of the barrel. That video was a bit hit with our readers. Today we offer another segment from the Grizzly DVD. In this clip, you’ll see Gordy dialing in the barrel using a Grizzly G0509G 3-Phase Gunsmith Lathe. Once Gordy finishes that process he’s ready to align the threaded shoulder and pre-drill the chamber. CLICK HERE for more photos from the DVD. The full DVD can be ordered from Grizzly’s Web Site. Share the post "Barrel Chambering with Gritters & Grizzly — Dialing In the Barrel"
After 10 years of hosting the Int’l Defensive Pistol Assn. 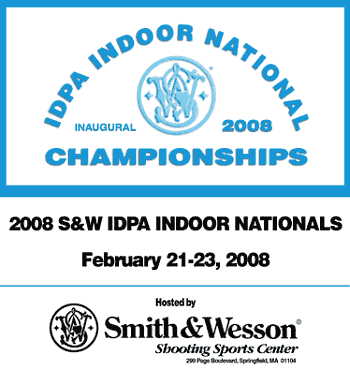 (IDPA) Winter Championships, Smith & Wesson will now hold the first IDPA Indoor National Championships February 21-23, 2008 (Thurs-Saturday). This year’s prestigious event will be held at the Smith & Wesson Shooting Sports Center in Springfield, Massachusetts. The 2008 IDPA Indoor National Championships will feature over 300 competitors in five IDPA divisions. Each participant will face nine courses of fire involving low-light conditions, moving targets, and defensive shooting scenarios. Along with the match itself (a half-day of shooting for each class), competitors can participate in Smith & Wesson factory tours, training seminars with Champions such as Jerry Miculek, and shooting demonstrations. For more info on this year’s IDPA Indoor National Championships including match details and important updates, visit www.matches.smith-wesson.com. Share the post "Smith & Wesson Hosts First IDPA Indoor Nationals"